Hi friend! I hope you’re having a lovely week. Though I’m posting this blog in the space between my trips to Orlando and Toronto, I actually wrote it over a week ago since I knew I’d be super busy trying to get everything in order for my talk at the Alice Turner Library and packing/doing laundry for my week in Toronto for Meghan Telpner’s Urban Culinary Nutrition Retreat Weekend Intensive. I know, super tricksy, right? Anyhoo, yesterday I stumbled upon this article discussing the rise of kombucha bars in several US cities. Obviously I was super pumped because kombucha is seriously one of my favourite bevvies ever and it’s great to see it making the mainstream and becoming more accepted in all social circles. I’m also trying to move away from booze as the centre of my get togethers with friends at pubs and restaurants, so having kombucha on tap would be amazing! Something fizzy and delicious that actually makes you healthier plus no hangover? Sign me up! In honour of my favourite fermented bevvie making it big, I thought I’d revisit my original post from a year and a half ago (HOLY CRAP HAS IT REALLY BEEN THAT LONG?!) and give you a mini crash course on the almighty booch. This post was the second one I ever published and looking back it amazes me how far we’ve come together. Let’s dive in, shall we? Looking back on that first post about kombucha I was just as freaked out as most of my clients and friends are whenever I mention that I drink fermented tea every day. Oh how far it’s come! I can’t even imagine my life without kombucha and if I don’t drink at least one large glass a day, I can feel it in my tummy. Kombucha has been drunk in some form or another in Chinese, Russian, German (and others) cultures for at least 2000 years. Even if there isn’t a ton of scientific research on out there on the specific health benefits and mechanisms of action of this sweet tea bevvie, I’m going to put my trust in the ancient wisdom of the past and keep drinking with impunity! Kombucha may contain some or all of these bacteria and/or yeasts, which are responsible for producing the carbonation, acetic acid, gluconic acid, and lactic acid. Read more here. There isn’t a huge amount of research done on kombucha in the Western world, though Kristen over at Food Renegade pointed me in the direction of German and Russian research from the early 20th century on the health benefits of this sweet, sweet drink. Check out a synopsis here. Many of the nutrients and compounds found in kombucha are great for helping with liver detoxification. The importance of a strong liver in maintaining balanced health cannot be overstated. This giant organ takes care of so many functions in our body from digestion to detoxification that it can easily be overwhelmed if we’re consuming too much garbage or slathering our bodies with toxins. Drinking kombucha is a great way to give your liver some love by improving its efficiency and taking some of the strain off of it. One of the most important benefits of kombucha is that it is an amazing digestive tonic. As mentioned above it contains some healthy acids, which can help improve our digestive function. It’s also a great source of healthy bacteria and yeasts that colonize our intestinal tracts, help with digestion, assimilation, and keep our immune systems healthy and regulated. Kombucha also shares similarities with vinegar, thanks to its acetic acid content, and so can help with blood sugar regulation. Check out this article on Green Med Info for a list of wicked citations to get more information. Alrighty, now that we know a little bit more about this magical elixir, lets look at some specifics on how to make our own brew. Keep your SCOBY brew in glass jars only. Do not use flavoured teas as the oils can damage the culture. Black, green, or pu-erh are my recommendations. Handle your SCOBY by hand as little as possible, as the oils from your skin can also damage the culture. Keep your brew somewhere warm and out of direct sunlight. Don’t stress and have fun! Find a 4-10L glass jar in which to ferment your tea. Add your SCOBY and the starter liquid to your brewing jar. Bring 2 L of water to boil in a pot with 6 teabags. Use only unflavoured green, black, or pu-erh teas. Once water has boiled, remove tea bags and add 1 cup of sugar. If you are using a jar that is over 5L, add an extra cup. Stir in sugar and allow to cool to room temperature. Once cooled pour tea into brewing jar and fill remainder of the jar with water, leaving 2-3 inches of space from the top. Place a tea towel or face cloth over the opening of the jar and secure with an elastic band. Place your SCOBY and tea out of direct sunlight, somewhere warm. Near the fridge or baseboard heater is a good space. Allow tea to ferment for 7-9 days. Taste and if it is still too sweet, let it go another day. I’ve also left it for up to 3 weeks with no ill effects. It just becomes less sweet as time goes on and more sugar is digested. Pour fermented tea into separate glass jars, seal and store in the fridge. Once tea is brewed, puree a fruit of choice with water (I like combining strawberries and cranberries) until you have a slightly thicker juice. Pour 1/4 inch of juice into the bottom of your glass jars, add kombucha, seal and let sit for two days somewhere warm. After two days, strain out the fruit pulp, return to jar and enjoy an extra fizzy, flavoured kombucha! Get creative with your combinations until you find your favourites. Well there you have it folks! 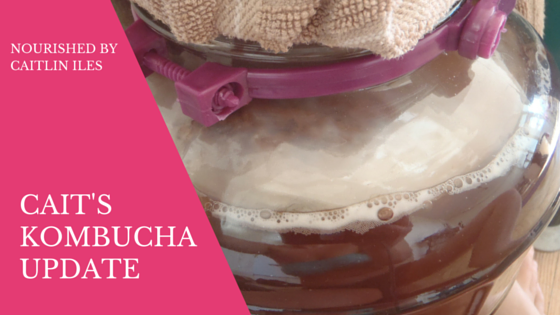 My quick and dirty guide to all things kombucha. If you live in Saskatoon and want to buy a SCOBY for $15, contact me to pick one up! I’ve got plenty of babies just looking for a good home. And if you’re interested in taking your fermentation to the next level you can download my FREE e-book Eat Your Way to a Healthy Belly with Fantastic Fermentables. It’s got 15 vegan and paleo friendly beginner fermentation recipes to get you started. Click here to get your copy! Just came across your article on Kombucha. Do you still sell SCOBY? If so, would love to buy some off you. Hi. I would love to start making my own Kombucha tea. My mom use to make it when I was young, and I was just recently reminded about how good it is for us to consume. Would I be able to purchase and pick up a “scoby” from you next weekend? I currently live in Saskatoon. Sorry I missed your comment! If you would still like a SCOBY I have some available. Send me a private message at caitliniles@live.com to chat about it. Have a great day! PS. I am assuming a “scoby” is the start of the kombucha fungus that you grow?